Many companies are discovering the cost-saving benefits of rebuilding their existing French or TMP equipment or purchasing a rebuilt hydraulic press, rubber mixer, screw press or other equipment. Rebuilding can be less expensive than purchasing a new machine, and production downtime can also be reduced because of faster turnaround times on rebuilds. Because of these advantages, one of our customers recently asked French to rebuild 10 hydraulic presses and has experienced over a 20% energy savings since operating their newly rebuilt hydraulic presses. 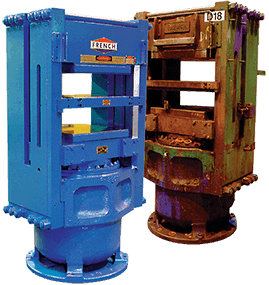 French is the ideal source to rebuild your French or TMP Hydraulic Press, Rubber Mixer, Oilseed, or Polymer equipment; from machining and partial refurbishments to complete overhauls. French maintains extensive records on all of the machines it has built, including blueprints and assembly diagrams. These proprietary resources allow French to provide high-quality, precision rebuilding services. As always, French performs rebuilds with the same attention to detail we employ on our new machinery, ensuring you many years of reliable service and reduced total life cycle costs. French custom-tailors rebuilds to fit any budget or process requirement. Equipment can be rebuilt to original factory specifications or your specifications. The Rebuild Sales team can also help you locate suitable used equipment to rebuild.